It has been a very good cricketing year, lots of interesting ODIs and T20Is were played during 2012 but I have no doubt in saying that it was the Test cricket which provided us the most joy and entertainment. If someone still believes that Test cricket is dying, is either living under a rock or has lost all of his senses. Though it wasn't a good year from India's point of view but if you look at the larger picture as a Test cricket fan, you will be satisfied with it. So, I have decided to do a little analysis (my first attempt) with the help of Statsguru and will try to pick a World Test Team of the Year in this post. Out of 42 Test matches played in the year, 32 ended with a positive result i.e. 76.19%, which is higher than last year's 69.23%. If you go by number of wins then Australia were the most successful team with 7 wins in the the year but most of it came at their home. 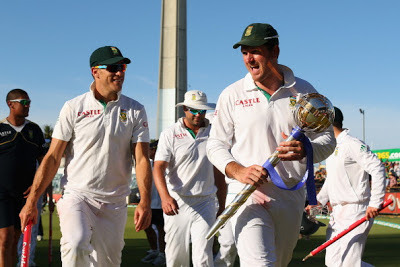 But in my opinion, with 3 series wins overseas (New Zealand, England and Australia), South Africa were the Test team of the year and I know most of you will agree with it. Even after winning a Test series in India after 28 years, England lost the most number (7) of Test matches in 2012. Some call it a curse of No.1 rankings, some simply accept it that they played bad cricket in major part of the year, just like India. If you go by Win/Loss ratio then New Zealand were the worst Test team of the year (not counting Zimbabwe and Bangladesh). Their Win/Loss ratio was 0.33, India and Sri Lanka not too far behind. South Africa were the only team to not lose a single Test match in the year. Now time to pick World Test Team of the Year. I will try to give reasons too. Cook had a very good year both as a captain and a player. He may bore you at times but he is effective. With 1249 runs at an average of 48.03 and with 4 hundreds, he was among top 2 run scorers of 2012, so he is an automatic choice for an openers' slot. Alviro Peterson gave him a run for his money as a second opener, he has almost the same runs and average but I have decided to chose Smith for this slot. His performance in 2012 - 825 runs in 19 innings at an average of 48.52 including 3 hundreds and 2 fifties. Two reasons why I have picked him - 1. His 4th innings batting ability, 2. For his captaincy. As any other World Test XI. I need a captain for my side and currently who is better than Smith? He is my Test captain of the year. It has been another fine year for Hashim Amla and since Dravid and Ponting have retired, there is no doubt in my mind in saying that he is the best No.3 batsman in World Cricket today. There isn't any real contenders either. He scored 1064 runs in the year, at an average of 70.93 including 3 hundreds and a Triple hundred. Some people call him crab, some don't like his batting style but no one can deny his impact. After, retirement of Brian Lara, he played many crucial knocks for West Indies and he is undoubtedly a Legend. As far as 2012 is concerned, he had a great year and played good knocks against Australia, England and Bangladesh and that is why I have included him. Kevin Pietersen was his prime competitor but he played 10 more innings than Chanderpaul and scored just 66 more runs, also he averaged just 43.87 in comparison to Chanderpaul's 98.70. With 5 hundreds, including 3 Doubles and 1 Triple, Michael Clarke owned the 2012 and scored most runs i.e. 1595 at a mind boggling average of 106.33. Looks like captaincy is bringing out the best from him. He scored 346 more runs than Alastair Cook who is No.2 in the most runs chart. If you want to know his impact then look at Hashim Amla, who himself had a wonderful year. Amla played almost same number of the innings but he scored 531 less runs than Clarke. It was clearly Michael Clarke's year. He is my Test batsman of the year. As every good team needs an all-rounder, Jacques Kallis is the automatic choice for No.6, there was a close contest between Kallis and Hussey for this slot though but even if you talk about only batting then still Kallis trumps Hussey, he scored 46 more runs than Hussey and played 3 innings less. He is my Test all-rounder of the year. Prior is a kind of wicketkeeper which every Test team will like to have, he has been consistent with bat and has the ability of scoring some crucial runs with tailenders. With 777 runs and 36 dismissals in 15 Tests, he is my Test wicketkeeper of the year. With 60 wickets in the year, Rangana Herath books the spinner's slot in my Test team of the year. Graeme Swann was his closest competitor but he has taken 1 wicket less than him in 6 more innings. As far as Saeed Ajmal is concerned, his bowling record in 2012 is very impressive, he has 39 wickets in 12 innings at an average of 20.56 and strike rate of 46.4. But still Rangana has taken 3.33 wickets per innings compared to Ajmal's 3.25. Also, not including the highest wicket-taker in the Test team of the year won't be fair. He is my Test spinner of the year. With 43 wickets in 17 Test innings at an average of 21.11 and at an strike rate of 45.8, Philander is my first choice fast bowler. Since his debut in Tests last year, he has been exceptional. Calling him Test fast bowler of the year won't be wrong. Wicket-wise he was the most successful fast bowler in 2012 and should make it in every Test XI of the year. There was a myth that he isn't that much successful in sub-continent and would struggle during India-England Test series but he bowled really well and shut his critics up (including me). In the last two Tests at Kolkata and Nagpur, he took 10 wickets in 3 innings. His overall tally of 2012 is 48 wickets at an average of 29.50. Peter Siddle and Stuart Broad were his closest competitor but looking at the innings, average and strike rate, Roach is the third fast bowler in my world Test team of the year. Kemar Roach has taken 39 wickets in 2012 and he averages 22.25, his strike-rate of 41.0 is the best among bowlers with more than 20 wickets in the year. In comparison, Siddle and Broad have taken 41 & 40 wickets at an average of 23.09 & 31.70 and at a strike-rate of 47.3 & 62.7 respectively. Now that almost everything is done, what's next? Test knock of the year? Though he didn't make it to the Test team of the year, Faf du Plessis' unbeaten 110 off 376 balls in his debut Test against Australia is the Test knock of the year, in my opinion. Thanks for reading. Hope you liked my analysis. Picked Anderson because he was the highest wicket taker among fast bowlers, also he had a good Test series in India.